This Official Samsung Clear Cover is the perfect accessory for your Samsung Galaxy S9 smartphone. The reviews for this are great but it isn’t what I was expecting. It’s not what I would call a snug fit and I’m not sure it will provide much protection. Being an official Samsung product I was expecting better. 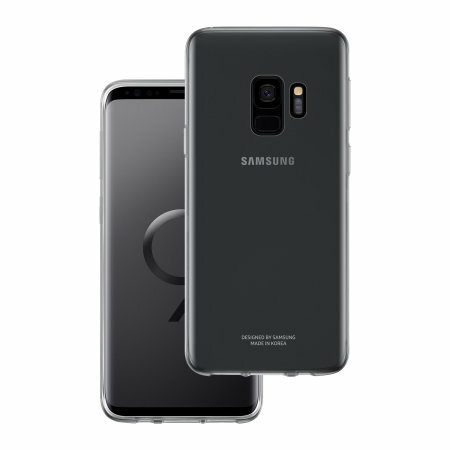 Hi I already have this case for my own S9 so when my grandsons iPhone broke I immediately ordered this as he decided on S9 in black as its an original Samsung the case is perfect shows the beauty of the phone while giving good protection. This case being the official Samsung fits like a glove it protects all round cutting outs in right place etc the case for my s7 which was also purchased on this site was also clear and extremely hard-wearing but that was more hard plastic this is more rubber tight fit but easy to get off if you need to. I have the new sunrise gold s9 case complements it perfectly as for previous comment I've had no problem with stuff getting stuck round the edges but then I regularly take my phone out and clean it, it's my pride and joy ???? This is my favorite case for the S9. It is perfectly clear and shows off the Lilac Purple back nicely. No yellowing at all. All the cutouts and buttons are perfect. The fit is snug, and the case seems like it will do a decent job protecting the case because of the shock absorbing TPU material. The case also is slim and comfortable to hold, even for extended periods. This is clearly an OEM case, and I highly recommend it. As above, but it has almost a jelly like consistency so it flexes. After just a day, Ive started to get dust/lint collecting around the edges/underneath the protector which makes it look a bit messy. Its not a hardship to clean away but I never seemed to have this issue with the official S7 cover, which was a much more solid material that clicked when you put it on the back of the phone. Does it fit?no worries always does.